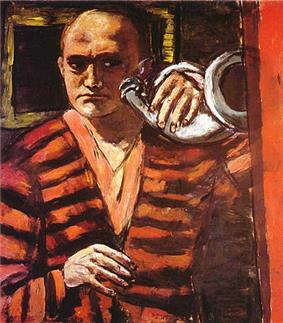 Many of Beckmann's late paintings are displayed in American museums. He exerted a profound influence on such American painters as Philip Guston and Nathan Oliveira. His posthumous reputation perhaps suffered from his very individual artistic path; like Oskar Kokoschka, he defies the convenient categorization that provides themes for critics, art historians and curators. Other than a major retrospective at New York's Museum of Modern Art, the Boston Museum of Fine Arts and the Art Institute of Chicago in 1964-65 (with an excellent catalogue by Peter Selz), and MoMA's prominent display of the triptych Departure, his work was little seen in much of the United States for decades. His 1984 centenary was marked in the New York area only by a modest exhibit at Nassau County's suburban art museum. The Saint Louis Art Museum holds the largest public collection of Beckmann paintings in the world and held a major exhibition of his work in 1998. 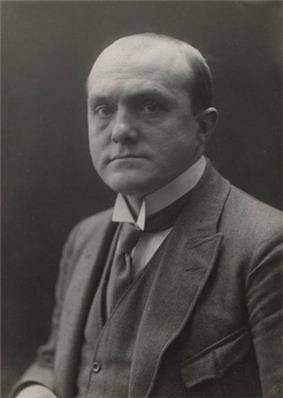 Several important works by Beckmann were discovered in the Munich flat of Cornelius Gurlitt (art collector) in 2012, and are the subject of intense scrutiny by the German police and art historians for their provenance and sale during the Nazi period. ^ Schulz-Hoffmann and Weiss, Max Beckmann: Retrospective. Munich: Prestel. ISBN 0-393-01937-3, 1984, p.69. ^ Rainbird 2003, p. 272. ^ a b c d e f Max Beckmann Museum of Modern Art, New York. ^ "Beckmann". Spaightwoodgalleries.com. Retrieved 2012-03-12. ^ Rainbird 2003, p. 274. ^ a b Michael Kimmelman (June 27, 2003), "Chuckling Darkly at Disaster", New York Times. ^ Stephen Kinzer (August 12, 2003), "As Max Beckmann Gets a New York Spotlight, St. Louis Shares in the Glow", New York Times. ^ a b Max Beckmann Guggenheim Collection. ^ Robert McDonald (February 7, 1987), Art Review: "German Masterpieces Dazzle At San Diego Museum Of Art", Los Angeles Times. ^ Rainbird 2003, p. 283. 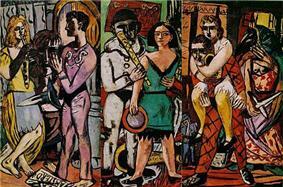 ^ Schulz-Hoffmann and Weiss, Max Beckmann: Retrospective. Munich: Prestel, 1984. ISBN 0393019373, pp. 161-162. ^ "Centre Pompidou - Art culture musée expositions cinémas conférences débats spectacles concerts". Centrepompidou.fr. 2000-09-14. Retrieved 2012-06-22. ^ Catherine Hickley (December 9, 2011), Review: "Vampires, Ghosts Haunted Max Beckmann During U.S. Exile", Bloomberg. von Wiese, Stephan (1978). 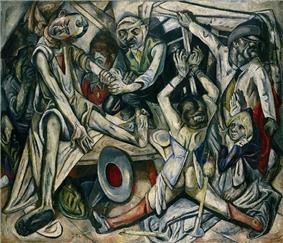 Max Beckmann : Das zeichnerische Werk 1903–1925. Düsseldorf. Anabelle Kienle: Max Beckmann in Amerika (Petersberg: Michael Imhof Verlag 2008), ISBN 978-3-86568-243-7. Françoise Forster-Hahn: Max Beckmann in Kalifornien. Exil, Erinnerung und Erneuerung (München / Berlin: Deutscher Kunstverlag 2007),ISBN 978-3-422-06733-2.